Last week we heard the story of Jacob, renamed Israel. In the intervening chapters, his sons’ have picked up the family tradition of trickery. To get rid of their father’s favorite son, Joseph, they sold him to traders and then told dear old dad that he had been murdered. In truth, Joseph ends up in the court of the Pharaoh and helps Pharaoh prepare for a coming famine. Eventually, the brother’s deception is uncovered, but only after famine has arrived back home and Jacob sends his family to Egypt seeking food. The story of Joseph helps us understand how the people of Israel became slaves in Egypt. They left their homes because to stay was to die. Our biblical ancestors are not unlike the Syrians, Iraqis, Sudanese, Guatemalans and others who are on the road today, seeking life in a new place because there is nothing for them in their homes but danger and death. The Hebrew people have grown numerous and have thrived in their new land. But a new Pharaoh has taken the throne. And he didn’t know Joseph. And he doesn’t remember the stories about how Joseph saved Egypt. And when economic or political situations take a turn, people have a tendency to “circle the wagons”, so to speak. We ignore our history, we forget that we too, or our ancestors at least, were once immigrants in a new land. We focus our fear on outsiders. And so Pharaoh oppresses the refugee Hebrew people and enslaves them, forcing them to build and labor in dangerous and inhumane conditions. Even those horrible conditions don’t keep the Hebrew people from surviving and thriving. So Pharaoh kills all the baby boys, to prevent them from growing up to be threats to Egypt. It is into those conditions that Moses is born. Today’s readings skip the fairly important chapter describing his birth. His mother, continuing the “trickster” qualities of her ancestor Jacob, manages to get him out of harm’s way and so he doesn’t die according to Pharaoh’s plan. Moses was the original Boy Who Lived, long before Harry Potter came along. He knew what it was like to not belong, to be different from everyone else. Adopted into Pharaoh’s own house, but aware that he was Hebrew, he saw the way he benefited while his birth family were enslaved. He even murders an Egyptian who is harassing a Hebrew man, and is judged and found wanting by the Hebrew people who see the crime. He has no place to call home. Moses can’t fix the injustice. He is expendable to Pharaoh. He is seen as an outsider by his own people. And so he leaves. Our story picks up today when he’s 10 miles past the middle of nowhere, tending the flocks of his father in law, Jethro the Midianite. 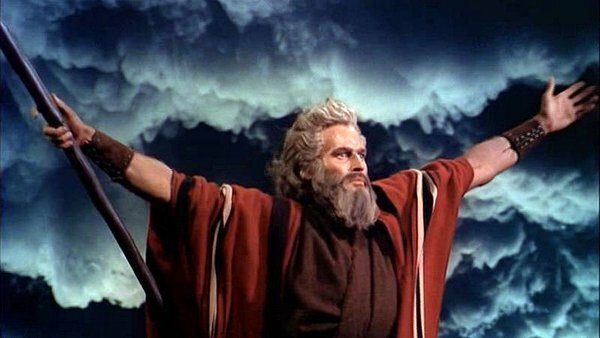 When I think of Moses, no matter how much I wish I had another image, I confess I picture Charlton Heston. And if we know the end of his story, we think of him in heroic terms. He leads the people out of slavery and out of Egypt! Huzzah! Moses is not heroic at the beginning of his story, though. He’s a mess. On the run. Without friends or clear plans for the future. And it is this Moses that God calls. Not the Charlton Heston Hero Moses. God calls the refugee, stateless Moses. I don’t know if you have the experience of being claimed as a member of a particular tribe or group of people. As an adopted child, I find resonance in Moses’ story. And to be claimed, as Moses is claimed here—I am the God of YOUR father, the God of Abraham….etc—by the tribe that didn’t raise you is very powerful. Many of you have heard some of my story. My birth mother does not want to meet me, and my birth father died 19 years ago, but my birth father’s family, the McCourts, have claimed me. Many of you met his daughter, my half sister Carol, when she visited in August. And one of my cousins from his family just sent me a photo last week. 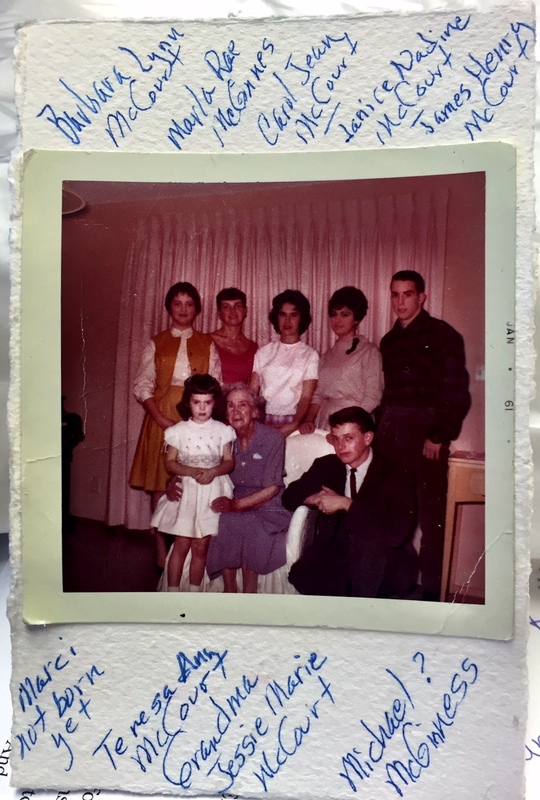 It is a picture of my McCourt cousins taken in 1961 with their (our) grandmother. And as my cousin labeled who everyone in the photo was, she wrote my name on the picture and put “not born yet”. Thank you for this, Barbara! I already had a family of course, so I wasn’t as adrift as Moses was, but I am still grateful to have been claimed by my birth father’s family. I’m not sure I’m going to go deliver them from slavery or anything, but I will say there is great gift and power in being claimed. I wonder if people who know they belong, people who are welcomed and claimed, are better able to hear God’s call. What is it that took Moses from being a refugee who didn’t belong to becoming the leader of his people, standing up to Pharaoh? Before God tells Moses what he will do, God claims him. Don’t underestimate the power of that claim on Moses as he moves forward in this story. He isn’t claimed just by anyone, but by the God of his father. Even though he was raised in Pharaoh’s house, Moses belongs to God and to the people of God. And by responding to God’s claim, Moses denies the claim of Pharaoh, which says he doesn’t matter, and says other people are expendable. And on the holy ground at the burning bush, God makes sure Moses hears a better claim and offers an important call. God is sending Moses to Pharaoh to deliver God’s people out of Egypt. 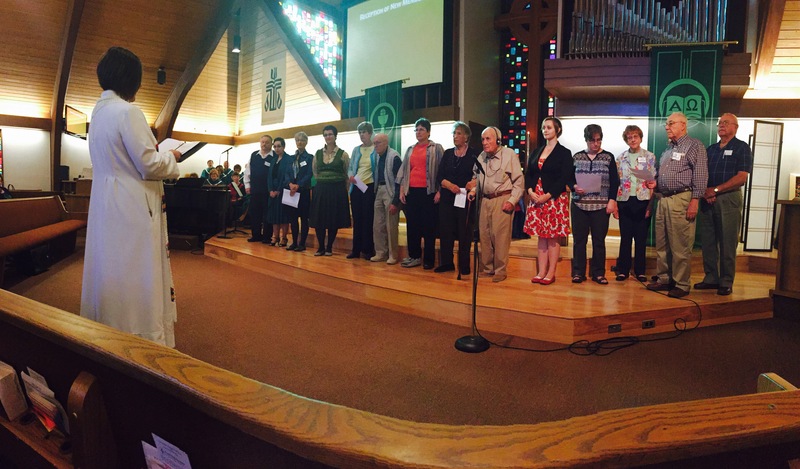 Today in worship, we have the privilege of welcoming 15 new members into our family. They are claiming the promises made in their baptisms, joining their faith journey with ours. As you listen to the liturgy when they join, notice the language of claim and call. Remember your own baptism and the claim and call God has made to you. We love our new members! I read the newspaper, often with much sadness, as we kill each other in gun massacres and use various classifications to divide and separate—and I think it is easy to see a world where people know neither their claim or their call. When we don’t know we are, when we don’t feel we are, claimed and connected, we act as if we believe Pharaoh—subjugating others and disregarding the worth and value of their lives. God claims us and God calls us, as God claimed and called Moses, because God has seen the misery, and heard the cries of God’s people. We are the people to respond. We are the people to stand up to Pharaoh. We are the people to share the Good News that Pharaoh’s claim on us is a lie. As we read on in Moses’ story, we’ll discover Moses didn’t feel particularly qualified to do the job either, so don’t let that stop you. We are standing on Holy Ground. May we hear God’s call because the world sure needs to know a better truth. Amen. October 4, 2015 in birth family, Exodus 1, Exodus 3, gun control, gun violence, Pharaoh, Sermon, xenophobia.